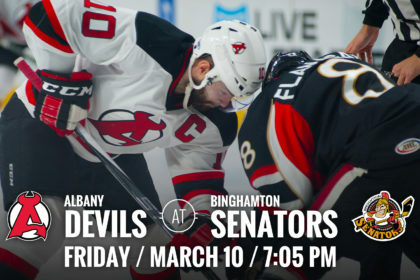 BINGHAMTON, NY – The Albany Devils travel to Binghamton to take on the Senators Friday for a 7:05 pm puck drop at Floyd L. Maines Veterans Memorial Arena. 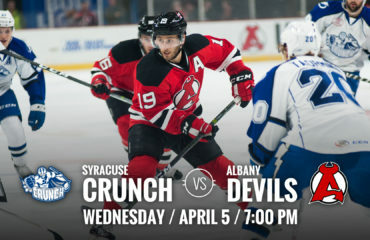 The Devils will look to bounce back after being shutout for the fourth time this season in a 3-0 loss to the Utica Comets. Their record is 32-25-1-1. 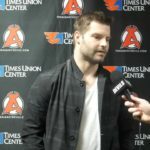 The Senators are coming off of a three game weekend which they ended by defeating the Syracuse Crunch 6-4.Their record sits at 24-32-2-1. 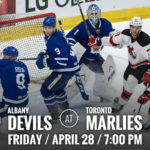 Head to Head: The Devils hold a 4-3-0-0 record this season against the Senators heading into Friday’s final regular season matchup between the two teams. 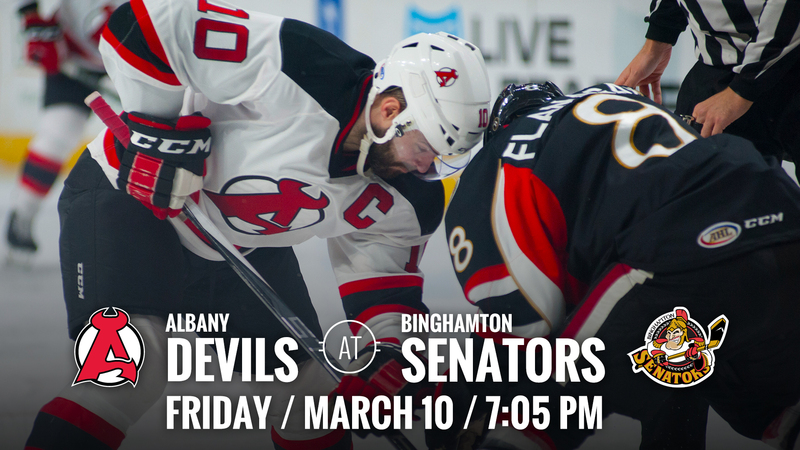 Binghamton came away with a 6-2 win the last time the two faced off on February 4th. 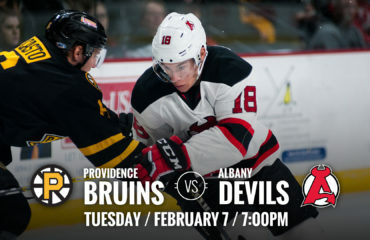 The Devils stand at second place in the North Division and seventh in the Eastern Conference with 66 points. The Senators are sixth in the division and twelfth in the conference. They currently have 51 points. Points Leaders: Ben Sexton leads the team in goals against the Senators so far this season with four but is tied with Brian Gibbons for five points in seven games played. 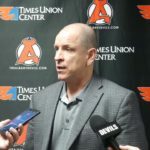 Sexton has four goals, one assist while Gibbons has three goals and two assists. 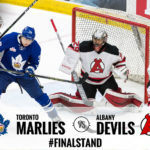 Mike Blunden and Nick Paul each have five points in the seven games played. Blunden with two goals, three assists and Paul with five assists. 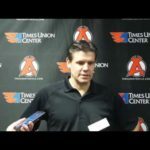 New Jersey Watch: Ken Appleby and Kevin Rooney got recalled to New Jersey from Albany Wednesday. 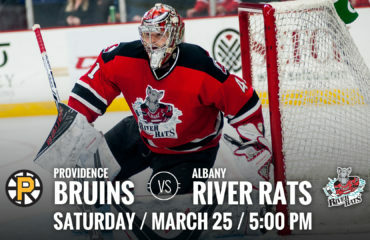 Rooney most recently played in three games with the NHL club after being recalled from March 1 to March 5. This is Appleby’s first time being recalled.